After a quarter century of the community holding off development in Ballona, the State of California, under Governor Gray Davis, acquired the wetlands in 2003. Soon afterwards, it became the Ballona Wetlands Ecological Reserve (the Reserve). The land is now permanently protected from development, serving as a habitat for wildlife. Restoration planning began and in the Fall of 2017 the California Department of Fish and Wildlife (CDFW) and US Army Corps of Engineers released plans for restoration through a Draft Environmental Impact Report (DEIR). CDFW is the lead agency for the planning, implementation, and management of the restoration of the Reserve. CDFW received thousands of comments on the DEIR to restore Ballona. They are currently reviewing and replying to comments and developing the final report, which is expected to be released in 2019. Friends of Ballona Wetlands is a founding member of the Wetland Restoration Principles Coalition, which developed the 9 Restoration Principles to maximize every opportunity for comprehensively and scientifically restoring degraded wetlands. A subset of this group, the Steering Committee, has been working diligently to Bring Back Ballona. Five members of the Steering Committee– Friends of Ballona Wetlands, Heal the Bay, Los Angeles Waterkeeper, The Trust for Public Land, and The Surfrider Foundation– crafted a joint comment letter to CDFW in support of restoration and asking questions to ensure a science-based process that protects our natural resources. READ the Wetlands Restoration Principles Coalition Steering Committee Comment on DEIR. We also encouraged the public to show their support for restoration by Endorsing 10 Primary Restoration Goals, including creating diverse habitats, improving biodiversity, protecting rare and sensitive species, and creating public access. We support science-based restoration and sharing fact-supported information. Why Does Ballona Need Restoration? • Ballona’s health is extremely poor; the wetlands were saved from development, but not restored. • The construction of Marina Del Rey permanently destroyed nearly 1/2 of the Ballona Wetlands & dumped 3.1 million cubic yards of fill on the rest, piled 15-20 feet high in some places. • A majority of the wetlands are not wet because they are disconnected from Ballona Creek. • A serious weed epidemic has degraded more than 70% of this protected area. Much of Ballona is covered in invasive plants, like iceplant, castor bean, and mustard. Essentially, restoration will remove weeds and excess sediment, reunite Ballona Creek with its historic floodplain, expand habitat and native plant cover to benefit wildlife, and create a system of pedestrian and bike trails for visitors to enjoy. • Create public access for recreation and educational activities. Restored Ballona Freshwater Marsh, 2018. • Most of the Ballona Wetlands Ecological Reserve is dry, and wetlands need water to exist and thrive. • All three alternatives proposed in the DEIR include reconnecting the wetlands to its water source, Ballona Creek, & removing excess fill that was dumped during the construction of Marina Del Rey. • Machinery was used to destroy the wetlands, so it would be impossible to restore them without machinery. • Sediment removal will be done in a careful and well-planned manner. What About the Animals There Now? • Some common LA animals, such as rabbits, lizards and gophers, may be displaced. • Before restoration, they will be relocated to safer areas. • Work will proceed cautiously, restoring small areas, one at a time, & will be strictly monitored. • Typically a biologist is assigned to every piece of equipment to ensure that no animals are in its way and if there are, that work is stopped to relocate them safely. • No rare or endangered animals will be harmed and their habitats will be expanded and improved by this restoration project. • Wetland-dependent species with nowhere else to go will benefit. • The threatened Belding’s Savannah Sparrow currently nests at Ballona, and the endangered Ridgeway’s Rail could nest there. Both have lost 90% of their habitat & desperately need this area to be restored. 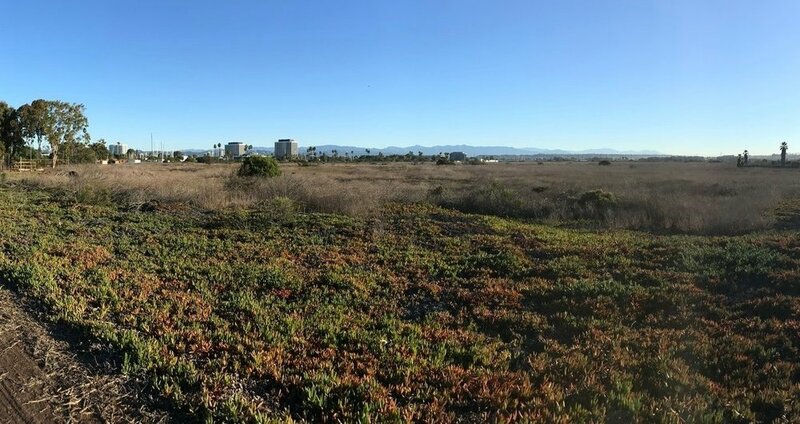 • Other sensitive wetland species that will benefit from restoration include the Southern California salt marsh shrew, South Coast marsh Vole, Wandering Skipper Butterfly, Western Meadowlark, Loggerhead Shrike, intertidal invertebrates (an important food source), and many others. • The endangered California least tern may benefit from additional food resources and the fish of Santa Monica Bay depend on the sheltered wetlands to lay their eggs.